Below is the easiest and quickest way to test if your DSLR has an autofocus issue, along with a recommendation on what to do if there is a problem. 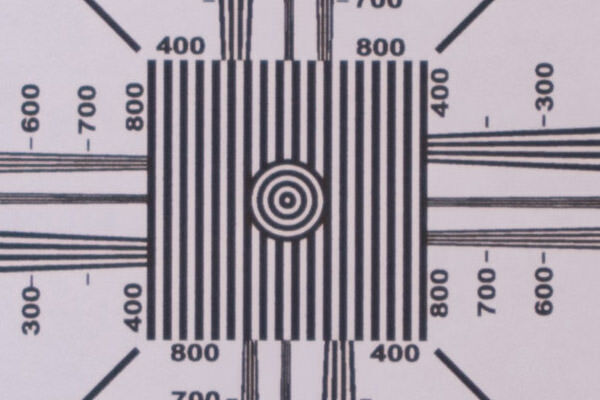 This test can be used to detect front focus or back focus issues with a particular lens or a camera body. I will be using the Nikon D800E as a reference camera for this article, but any modern DSLR with Live View capability can be used for the same test (even entry-level DSLRs such as the Nikon D3200 have a Live View mode). Why would you want to test your camera for autofocus issues? Because if your camera or your lenses are defective or have a calibration problem, then you will not be able to obtain critically sharp images. Any DSLR with Live View mode capability such as the Nikon D7000. At least one lens, but preferably 2-3 lenses if you want to isolate the problem to the camera or your lenses. A flat vertical surface in a very brightly lit area. For example, your garage door or a wall inside your home that is adjacent to a very large window will do fine. Print out either this Siemens Star Focus Chart or this Focus Test Chart on regular letter size paper. You can print it on a laser printer or inkjet (doesn’t really matter). Make sure to print on regular paper, not anything glossy like photo paper. Scotch tape or some other adhesive material to keep the focus chart on the wall. 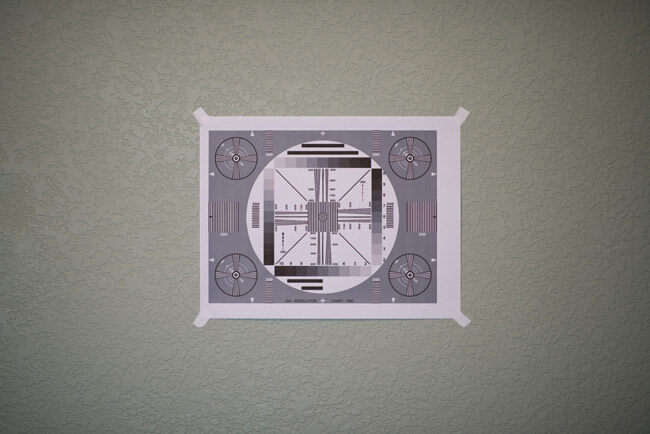 Pick a spot on your wall where you will hang the focus chart. The wall must be vertical and straight. 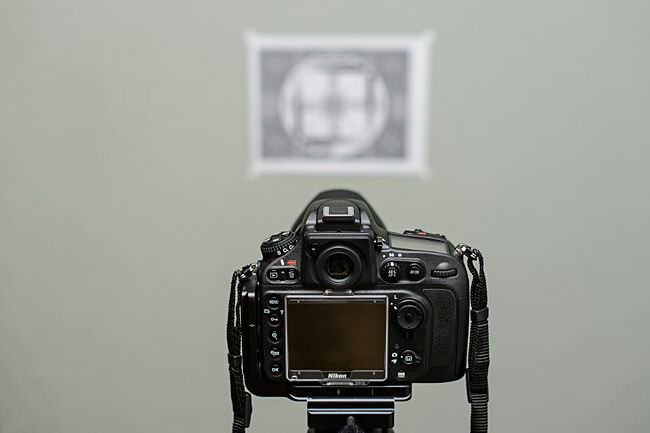 You want the focus chart to be right across from the camera, so do not hang it too high or too low. Please note that I captured the image above the camera to show where the focus chart is relative to the camera. The focus chart is located right across from the camera. Switch your camera to full Manual Mode. Set your lens aperture to maximum aperture. For example, if you have a Nikon 50mm f/1.8G lens, set your aperture to f/1.8. Set your ISO to base value such as ISO 100. Use the exposure meter inside the camera to determine the optimal shutter speed. Take sample shots and make sure that you can see the chart clearly. Ideally, your shutter speed should be pretty fast at something like 1/500 of a second. If you are getting really slow shutter speeds like 1/10, then it means that you do not have sufficient ambient light. Either take the setup outside and do it in bright light, or add more light to illuminate the focus chart. If the amount of ambient light is insufficient, your test will be flawed. It is extremely important to make sure that you are doing this in a well-lit environment, since the Phase Detect sensor on the camera needs plenty of light. Make sure that AF Fine Tune/AF Micro Adjustment is turned OFF if your camera has it. On the Nikon D800, for example, you go to Setup Menu->AF fine tune->AF fine tune (On/Off)->OFF. Set the focus point to the center focus point. The center focus point is always a cross-type sensor, so it is the most accurate in your camera. Turn off any sort of lens corrections in your camera (vignetting, distortion, chromatic aberration, etc.). You do not want anything to potentially influence the test results. Set the camera to AF-S/Single Servo mode. While this test should work for both JPEG and RAW images, cameras add extra sharpening, colors, etc to JPEG images. Therefore, I would recommend to capture test data in RAW format. Set your camera Live View mode to “Tripod” (if you have such a setting). If your camera has a Mirror Lock Up feature and you have a remote camera release, you can use those to prevent camera shake (can be very useful if your shutter speed is slow). First, you will capture the focus chart in Live View mode. This will be your “reference” shot. Once you turn Live View mode on, zoom in to the center of the focus chart and either half-press the shutter or press the AF-ON button on the back of the camera to force it to focus the lens. Go ahead and press the shutter button now and capture the image. Now analyze the image at 100% view and make sure that it is tack sharp in the center where the focus point is. If it looks sharp, you did everything right. If it looks blurry, then your camera did not acquire focus properly in live view mode. Repeat until you get a sharp image. Only keep one image that is sharp and delete the rest. The second image will be captured without Live View. Turn off Live View mode. Now look through the viewfinder and rotate the focus ring on the lens until the focus chart looks completely out of focus. We want to force the camera to reacquire focus. Now half-press the shutter button or press the AF-ON on the back of the camera to acquire focus and wait until you see a green mark inside the viewfinder or the camera beeps (if you have beep turned on), confirming that focus is acquired. Take a shot. Again, rack the focus by rotating the focus ring until everything is out of focus and repeat the process. Ideally, you should capture at least 3 shots this way, since you need to eliminate any possibility of a potential autofocus error. Before we analyze the captured data, let me explain exactly what you are doing here. First, you captured an image in Live View mode, then you captured an image normally, as you would if you were taking pictures. Why are we doing this? All DSLR cameras rely on a “Phase Detect” autofocus sensor located inside the camera (see my article on phase detection autofocus). The good news is that the Phase Detect system is very fast. The bad news, is that the Phase Detect sensor itself and lenses must be properly aligned and calibrated for this system to work. And that’s exactly what we are trying to test here. When using Live View mode, the mirror inside the camera flips up and the Phase Detect sensor can no longer be used to acquire focus. Therefore, the camera relies on a different focus method called “Contrast Detect” to acquire focus. The camera forces the lens to focus back and forth until the image looks sharp, which is why this method is very slow in comparison. However, because focus confirmation happens electronically through the camera sensor, it will always be accurate. That’s why we are using the first shot captured through Live View as a reference image. The image looks good and sharp. Please note that this is a RAW image without any kind of sharpening applied to it. As you can see, the image not only looks out of focus, but we are also seeing some aberration problems in the image as well (a pretty normal thing to see when an image is out of focus). All three shots were very similar, which clearly indicates a focus problem either on the lens or the camera body. It is critical to view images at 100% view and go back and forth between the reference image and the other shots to compare. If things look out of focus, repeat the whole thing again to confirm that you are indeed seeing a focus problem. You should either be getting consistently good results, or consistently bad results. If the results are consistently good and images look good shot to shot, then you do not have a focus issue. You can stop doing tests at this point and breathe – you are in good shape. If you are getting consistently bad results, then the next step is to find out whether it is your lens or the camera body that has an autofocus problem. 6) Is it the camera or the lens? As I have already pointed out, it is best to test multiple lenses when assessing the autofocus accuracy of your camera. If you only have one lens to test, then it would be impossible to tell whether the lens or the camera have alignment issues. Sometimes it could be both. If you have 3-4 different lenses, perform the above test on all lenses you have and see what you get. If all lenses show very similar results, then your camera is most likely to blame for AF issues. Still, it will be hard to pinpoint the exact source of the problem, because it all depends on how badly calibrated your lenses were before you started the test. See my article on lens calibration. I have been shooting with a number of different Nikon DSLRs during the last 6 years and none of them had a focus problem with most of my lenses. I tested 2 samples of the Nikon D800 and both were perfect, with no signs of focus problems. However, the Nikon D800E that I recently received clearly has a misaligned phase detect sensor, because none of my lenses can accurately focus with it. Dialing -20 in AF Fine Tune seems to be fine with some lenses, but clearly not enough for others, so the camera has a severe case of backfocus. Hence, I was able to isolate the problem to the camera. Interestingly, I also recently added another Nikon 14-24mm f/2.8G lens, which has a really bad front focus problem. When I use it on my Nikon D700, the focus is completely off and I have to dial +20 to get anything in reasonable focus. Guess what – when I mount it on the Nikon D800E, it focuses perfectly, because the focusing misalignment on both pretty much cancel each other out. So you have to be careful when trying to determine the source of the problem. So what do you do if you find a focus issue with your camera? Most people would take their camera or lens back to the place where they bought it from. While the return policy is created for this purpose, I would actually recommend NOT to send it back to the seller. Why? First, the seller will simply send the camera back to the manufacturer as a “defective” unit. Most of the time there is not even a note that explains why the customer returned it. The manufacturer receives the unit, re-assesses it in a lab, and if it cannot find anything wrong with the camera (which it won’t in case of AF alignment issues), it will put it back on the market as a “refurbished” item. A returned item can never be sold as new again. So by sending it back to the seller, you are not notifying the manufacturer of the source of the problem. In addition, there is no guarantee that the replacement you receive will be in any way better. I know some people keep exchanging their purchase until they get a “good” sample. Well, some do it 5-6 times and never get a good one! I don’t think you would want to wait for weeks to get the issue resolved, when it could be a matter of days for the manufacturer to address the problem. Also, by sending the item back to the seller, you are increasing the seller’s costs, since they put so much time and money to deal with defective products. It certainly also creates a lot of frustration for the seller to deal with these issues and they are obviously not to blame for manufacturer’s defects or QA issues. So the best thing to do is to either send it to the manufacturer for repair/fine tuning, or try to calibrate the camera yourself (for advanced users, see my article on how to calibrate lenses). All manufacturers have support service centers that specifically deal with these issues and defects. Plus, this is the best way to force the manufacturer to improve its QA process. If more complaints come in to the service centers, the manufacturer could tighten up their QA thresholds to cut down its escalating costs. Retain all sample images you have taken with the camera. Call the manufacturer’s service support number and explain in detail that you are having an autofocus problem with your camera. Provide the image samples to the support personnel and if they question your testing methodology, provide the URL to this article. Make sure to send both the camera and at least one lens for focus calibration. If you only have one camera and one lens then send both. If you have multiple lenses, send one or two lenses you had least problems with before you bought the camera. Absolutely make sure to point out that you have no problems with lenses on other cameras, so that they do not try to calibrate your lenses instead of the camera. Insist on making them pay for shipping and insurance if the product is under warranty. If the support person refuses to provide a paid shipping label, escalate the problem to the support manager. Why should you be paying for shipping a defective product in the first place? Excellent! Thanks for this timely article. Thanks for the article. I did the same test and found mine with problem. I ended asking a new one from amazon. My own reasoning and thinking is that i do not deserve spending 3000 dollars to have it fixed right after. I want one that is new and perfect. If people are willing to risk the refurbished camera then that’s their choice. I am willing to get as many replacement to get that perfect camera. Honestly though, this auto focus issue is getting huge. People all over amazon and nikon rumor talking about it. Way too many people have to deal with the auto focus issue. I am concerned ! Kevin, you are aware of the fact that AF calibration for lens/camera combination is nothing more than simply turning a few adjustment screws. There’s a difference between ‘tuning’ and ‘fixing/repairing’ and people need to understand that AF adjustments don’t include epoxy, mortar or gaffer tape. You had a new camera/lens. Instead of opting to tune it in you chose to send it back and claim a new one. Do you also send violins/pianos back if they are not in tune when you unbox them? Do you haul your new car back to the dealer and demand a new one if it comes with incorrect tire pressure? No wonder this planet is dying from overconsumption. While this is my own simplified view of the world it’s rather apparent that with just about any electronics/camera product about 80% of the “it’s broken” rambling over the web is just hot air. That’s like saying if you buy a car online, and when they deliver it, the guy hands you the key and says here is your new car. Oh and by the way…before you drive it, you’ll need to get a timing light and set the timing before it’ll run right. By the way…I DO have a timing light and know how to use it. But i’ll be ”damned” if I’m going to break it out to use on a new car, that I haven’t even drove yet. “…you’ll need to get a timing light and set the timing before it’ll run right. It’s not like that, at all. Just like some new cars have problems right off the showroom floor, some cameras have problems right out of the box. Most new cameras don’t have focus issues like most new cars don’t have timing problems. Thanks Nasim for a great article again. I really like your last recommendation, but I was curious if anybody has gotten a shipping label from either Canon, Nikon, or any other companies. I paid for a shipping label last time when I sent my camera in. To be worse, it was because that they used a defect part to fix my camera; as a result, the camera was still not working properly and I have to pay to ship it to them again. That was my experience with Canon and now I’ve switched to Nikon with a D800, and I Couldn’t be happier. :) I’ll test my camera later and see if it is focusing properly. I think it is from a later batch so hopefully it will work fine. That is what happened to me with Canon. The mirror fell off a 1 month old camera, paid to send it back, then received it with a huge piece of debris in the viewfinder. At that point, I still had to pitch a fit to get a prepaid label to send it back…again! Have a Nikon D800 now couldn’t be happier!!! Nice write up but I have a question. Is it reasonable to expect all your lenses to be in perfect tune and not need any AF fine tuning? By that I mean at what point, or level of incorrect focus, do you send the camera/lens to the manufacturer vs. AF fine tuning the lenses? There’s a maximum of adjustment between +20 and -20 on the Nikon cameras that I have. If you have several bodies and one is hitting +20 or -20 with most of your lenses, then you have a problem with that body. If your lenses are mostly good on both bodies but one is hitting +20 or -20 on both bodies, then you have a problem with that lens. Took me 18 months to cotton on to this, not until I bought my 70-200 f2.8 and 50 f1.4 was it obvious the focus point was behind the subject. Most of my lenses were at about +12 to +20 (think it was +). Took the camera to Nikon for a sensor clean and adjust that was quite cheap and lenses now sit -5 to +5. Great article Nasim… Really useful.. Thanks very much..!!! Thank you for the article. Does iso have any impact on the test? I don’t think ISO has anything to do with the AF system, but lighting condition does. You want to use a low ISO to get good resolution on the target to help the test be accurate. You are well appreciated Nasim. This will be truly helpful to many camera/lens owners. I will try it myself with my five lenses and my D300s and D700. You can test at all of those and will probably get different results with each. However, you can only set one adjustment value for a lens unless you have a Canon 1Dx, which allows two. You therefore favour the telephoto end in the value that you set because you have less depth of field there. thank you for your valuable time, i printed the focus chart and i’m gonna try it when i go home tonight, just wondering what does all those numbers and different lines and shades tell you, in the example above you looked solely on the center of the chart to make sure the lines are in focus and not blurred, but does the different numbers and shades and line thicknesses tell you anything regarding other aspects of the camera, should i be looking for any other anomilies. Thanks for this article. Im a beginner in photography so I didn’t realise this can be an issue. I have a 50mm 1.4 lens and I’ve always had auto focusing issues with it for over a year which I really found disheartening, even when using a tripod. I’ve recently found that the only way to get my focus point sharp is to use live view and zoom in and then manual focus (because manual focus doesn’t even work correctly when using the view finder). I do have a few other lenses that I’ve never had AF issues with, which has only recently started me questioning the focusing on the 50mm. I’m going to be doing the tests later with all my lenses. Thank you! Nasim, thanks for sharing and the effort you had put in. Excellent !! Thank you for sharing this ! There is one thing I don’t understand about this front/back focus issue: does it only manifest at wide apertures? Wouldn’t stopping down cure any focus issue by increasing the depth of field and thus the range of things in focus in an image? I suspect you may say ‘no’, and having been the victim of this focus issue myself (although I didn’t realise it at the time) I think I agree. But I don’t understand why that would be the case! Love the site, which has really improved my (and friends’) photography skills. Yep, it disappears when stopping down, exactly for the reason you mention. This is why I recognized the problem on my first D7000 only after several weeks of usage since I mostly shot architecture and landscape at that time, stopped down to f9 or so. So it “cures” the issue until you shoot a portrait (as an example) and wonder why the eye is blurred while the nose or ear (depending on back or front focus) appears sharp instead…..
Ironically, I was using a D7000 when the issue arose! It was a D7000 and the 17-55mm f/2.8 – a perfect combo you would imagine. The kit was a friend’s, but he is really happy with it and doesn’t seem to have any issues. Thought it might be my technique, but I’ve been shooting for nearly 20 years so was kind of frustrating! I’ve since upgraded my own kit to a D700 and Nikon 24-70mm, which is simply superb. I hired the 70-200 f/2.8 the other day to shoot a conference and loved it. Trying (unsuccessfully) to convince my wife that we should ‘invest’ in it!! Nasim: Single servo mode is just one head of the dreaded two-headed monster called auto focus. the first head, as you have demonstrated here is single servo mode, the other is continuous servo mode. i shoot sports all year long and know, from a lot of experience, that just because you can use af-s successfully does not mean that the camera is calibrated to shoot continuously. please email me so that i can talk to you at length about this nasty af problem that many Nikon cameras exhibit. In fact, the continuous mode of auto focusing is a much harder problem to diagnose. Elliot, can you please provide some detailed information about this to me? You will receive an email from me with this reply, so just reply back with some detailed information, along with some image samples if you have any. Would love to look into this in more detail. I have been shooting wildlife (bird photography) quite a bit with Nikon DSLRs and I would say that the Nikon AF system is currently the best on the market. Canon is catching up with their new AF system on the 5D Mark III and 1D X, but I still prefer to use Nikon for anything that moves fast. So it would be interesting to read your notes about AF-C. Thank you for the nice and timely article. I am a long time follower. However, I do not agree with your recommendation of sending it back to the manufacturer. I think the best option would be to send it back to the dealer rather than given the go around by Nikon support. There has been no official acknowledgment from them(probably fearing a costly recall) and not all the cameras return “fixed”. At that point the consumer will be left with no option but to keep it (15-30 days being the most common return window). When a consumer has paid $3000 for a product he/she deserves a flawless product and not serve as a guinea pig. Of all the online forums, this is the only place I see that worries more about the manufacturer and dealer than the reader/consumer. I myself have returned two cameras to the dealer. If I were a betting man, I would say that no more than 5% of the new cameras have any issues at all with their auto-focus. It’s easy to think that number is much higher because the people with problems make a whole lot more noise than those with perfect cameras. Not that I’m a big lover of Nikon but they stand by their camera and if there’s a problem they will accept it back and fix it. And yes, sometimes it doesn’t come back fixed while other times it comes back perfect. You should expect this when you buy a cutting edge high tech instrument like a D7000 or D800. But the real question I have is where does Nikon’s QC end and operator error begin? 90% of the time I hear of a problem camera it ultimately turns out to be an operator error. High resolution cameras like the D7000, D3200 and D800 require a level of skill not needed when shooting D90 or D300 or even D700. When I hear stories of cameras coming back from Nikon exactly the same was when they sent them in, my first thought is operator error. Yes, it is possible that Nikon did not fix the issue and yes, I would be very upset if it were my camera. But I also would begin to question myself and would work to insure I am not the root cause of the problem. I have a D7000 and D800, both have been exemplary cameras with excellent focus. When I first received my D7000, I thought there was a problem because many of my images were soft. I did some searches on-line and saw all the talk about AF issues but I also saw Nasim’s level headed article about D7000’s and operator error. I then re-evaluated my shooting habits and camera setting and wouldn’t you know it, my images were now sharp as a razor. This was a good lesson because right out of the chute my D800 was returning crazy sharp images, even hand held and the few that showed up soft were 100% operator error. There are far less faulty cameras and lenses out there than many people think. As I have said already, during the 6 years of shooting Nikon, this is the first time I am actually seeing a camera with a misplaced phase detect sensor. Yes, it is rare, but it does happen. I did not return my D800E back to the seller for two reasons – because a replacement is not available (severe backorder situation) and I know that Nikon will fix my problem. I have dealt with Nikon before and if I provide good explanation of the problem, they are ready to work with me to make things work. Yes, their service is not perfect and sometimes you do get less experienced technicians on the line, but that’s expected when you deal with a hardware manufacturer. I have worked with other much bigger companies in the past and trust me, their service is often much worse in comparison. I used the criteria set out in the article and tested all my cameras and lenses. The d300,d700,D3x all came through with flying colours. The D800 was the best. My lenses all came through the test too successfully. However, my D3x failed miserably. I tested and tested again to see if it was my fault. The tests were all the same. I am going to bring it back to the dealer with an extended description of my testing. I suspect they will send it back to Nikon for repairs. Mike, it is good to know that your gear is mostly good. Like I pointed out before, the phase detect calibration issue can happen on ANY camera. The Nikon D4 I have right now has a rather nasty case of AF problems. Thanks for this article Nasim. I just received my D800E this week and have not fired a shot in anger yet but after all the publicity about the autofocus issues I wanted to make sure I had no problems with mine and your article came at exactly the right time. For those interested I had mixed results: so far my 24-70 came through with flying colors but my 50mm F1.8 needed a -10 adjustment, my 20mm F2.8 needed a -20 and my 8o-200 f2.8 needed a -15 adjustment. Thanks Nasim, that was my impression but it’s a relief to hear it from you! I agree that this article is very clear and well-written. The only thing of value I would add is to test the lens at maximum aperture as Nasim describes, then do a second test at two stops down from maximum aperture. If the stopped-down version looks slightly LESS sharp, then the lens may have focus-shift. This is a common phenomenon with fast-aperture (i.e. f/2.0 or wider), medium focal-length lenses and can’t be corrected through calibration. It is most troublesome at close distances and wide apertures. It generally disappears once you stop down to f5.6 or so. Gordon, a thorough article explaining how to calibrate lenses has been posted – I also talked about focus shift there. In fact, take a look at this article on focus shift I wrote a while ago. Thanks, Nasim! Anyone else who wants the facts on focus shift should check out your link too. I returned my D3X to the dealer today for shipment to nikon. I included a detailed description of the techniques I usef. I also included a memory card with sample images. It will pprobably take 4 weeks. I will post the results when I get them. I completed these tests with all my lenses and found that I was having a back focusing problem. I really didn’t like the idea of sending my camera off to get it adjusted and being without it for weeks, so I researched how to do it and adjusted it myself last night. It was a fiddly job but very successful, and now has perfect AF. Linsey, coul you share where to find the focus adjust information? I’d like to take a look in case My camera needs some adjust. It was mainly the picture I referred to on this website to know which screw to turn. I needed to adjust the AF screw which is the one nearest to the back of the camera, closest to the sensor. My camera was back focusing, so with trial and error I figured that it needed to be turned clockwise (down) to correct it, in small increments, for my camera anyway. Hope this helps. I appreciate the “auto-focus test” article. Though I am not clear about this recommendation. “If it looks sharp, you did everything right. If it looks blurry, then your camera did not acquire focus properly in live view mode. Repeat until you get a sharp image.” Is there an adjustment to be made before repeating the test? Won’t repeating the test, without making an adjustment, be likely to give the same result each time? Thank you so much for this article. I have found in the past many focus charts online, but I wasn’t really familiar with the sources so I didn’t even bother downloading the image. Nasim, you are a trusted source and are pretty knowledgeable about photography and photographic gear, so I had no problem trusting the focus chart image you posted on your site. That having been said, I have been experiencing a horrible focusing issue with my Nikon 18-105 VR. Initially I assumed it was something that I was doing on my D7000 that was the issue. I’ve been a Nikon user for years and a photographer for many more, and even at first the D7000 had a bit of a learning curve. But having to stop my lens to f/10 for it to even begin to be sharp? Come on! Now even though the lens isn’t professional glass I figured it wouldn’t even be that bad, considering the fact that it didn’t have too many optics in it for being a run of the mill walk-around lens. After calibrating the lens using the chart that you included, that photographic reproduction of the 18-105 is amazing (considering the previous performance, and the fact that it is an entry level lens). Barrel distortion and vignetting set aside, it performs more along the lines of what I would expect to see in a product from Nikon as far as sharpness and color reproduction. I have a feeling that after the tsunami hit Thailand (where Nikon’s lens factory is based), they rushed a lot of their products out of there to prevent any damage, completely forgoing their more stringent QC policies/procedures. There is still an issue today with difficulty obtaining their 50mm /1.8 due to their still restricted supply. My biggest surprise, though? The 35mm f/1.8. That lens gave me no trouble in the past, but I still decided to take a few test shots of the focusing chart. A world of difference on that lens now, too! Thanks again. For both the D4 and the D800 apparently have the same hardware, right? But does that mean they’ll function just the same. I do not need more than 4 frames-per-second. So the D800 will be OK if it “really” focuses the same as the D4. Thank you so much for this article. Using it I have found out that my D800 also has the left auto-focus issue. I am now working with Nikon to resolve the problem. Again thanks so much. Thank you so much for this article. I suspected that something was wrong but thanks to this article I confirmed that my D800 has the left AF issue. I am working with Nikon at present to resolve the issue. Again thank you so much for your time and effort. I am wondering if the lesson in all of this is to spend more time shooting in live view? It seems to me this is going to give you the sharpest possible image. The only problem I have with that is, living in a cold winter climate, live view drains the battery quite quickly. I am using Reikan FoCal, a relatively new autofocus verification system that you may not be aware of. Using a tethered camera, it currently offers automated calibration for five Canon DSLRs and one Nikon one, and semi-automated calibration for two Canon DSLRs and eight Nikon ones. With the semi-automated test, you have to adjust the autofocus adjustment on the camera’s menu when FoCal tells you. Even the semi-automatic method is much easier and probably more accurate than a manual method such as you describe above, or by using LensAlign. I have a forum post on my experience here (dslrusers.com/viewt…68#p444168) and Martin Bailey has written a review www.martinbaileyphotography.com/2012/…ith-focal/. FoCal also offers methods to check for your sharpest aperture, find dust on your sensor and check focus accuracy from side sensor points and foreshadows a low light autofocus consistency check. (I haven’t tried any of these so far). I suggested to the designer a way they could incorporate an automatic test for focus shift (or semi-automatic depending on the camera) and they are incorporating that in the release after the forthcoming V1.50 (at a guess, in a month or so). Thanks to this wonderful article, I am able to do this test without a hiccup – step-by-step, just like a pro! The question I have is – all 3 images that I took through the Live View mode came out sharper than all 3 images that I took through the View Finder mode! All 3 images in Live View mode looked exactly the same (sharp). All 3 images in View Finder mode looked exactly the same (a little soft with chromatic aberration). I don’t know what to make out of this and what my next steps should be. Vipul, did you remember to defocus after the LiveView shot, before autofocusing and taking the shot through the viewfinder? This has to be done. I had the same result when I skipped defocusing. No, I did not defocus! How would I do that after taking a shot in Live View mode? Thank you for pointing this out. I found the defoucs step. My bad for missing that completely. I will give this a try again. Thanks!!! Great article, thanks! I have used this test to quickly check if my D4 had any focusing issues. Found no issues. I tested 50mm 1.4 and 24-85 lenses. P.S. This is my second D4 and so far everything is great! I have updated to firmware dated 4 July 2012 as well. My first D4 had a memory card door that had some movement in it, so I exchanged it. My experience : 24-70 is not sharp at the edges at f2.8 compared to the centre. If you use it on DX format the output looks great overall. Try testing with 50mm f1.8g. Thanks for this article Nasim. Tested this on my d800 and have some questions hope you can help me with. My live view shot reference is a bit sharper (when zoomed in) than the viewfinder shot samples. However, the viewfinder samples arent bad. In fact they are sharper than your reference shots shown in the article. Is that acceptable and normal? Great article. I have my D800 on order and was told I will be getting it in next two weeks. I am not sure what I am going to do but quite tempted to cancel my order considering number of complains reported here. Meanwhile, I tested out my trusted D700 with three lenses I have and I need some guidance. Slight difference in the focus between live view and view finder taken images for two of my lenses. 50/1.4 and 14-24/2.8 at 24. However there was no difference or very very negligible difference with 28-700/2.8 @ 200 and 70. I used Siemens chart with center focus and comparing lines in the center. I am guessing that since images with my 70-200 looks reasonably quite similar to Live View but not with other two lenses, AF in my D700 is fine and that my 50 and 14-24 may have lense issues. Is this correct or not so simple? If it is lense issue than can some one point me how to best to fix them? your article is great, you clearly explained how to verify the center focusing with both PDAF and Contrast Detection, but what about the RT and LT points? I read several of these tests and still can’t make it. To test the RT and LT, apparently I must have 3 Siemens Stars on the wall, where the RT and LT perfectly match the location of RT and LT focal points in the view finder. Do I always have the camera centered to the center Star while I change the focus points from RT to center to LT? Do you have a similar step by step instructions to test these focal points? Sorry if I missed it from the many answers in the blog. Thank you. 70-200 vr ii is little back focusing but i m not pro i dont do for money so its not big deal i ll keep this to. 1.4g whic recently bought from abes of maine will exchange it and i hope some thing worst then this wont come . and i put all cahrts here you may wanna take look thanks a lot and main question is do i have to send 70-200 vr ii for exchange until find tac sharp one its really painful to go to ups many times ? I have read in your articles that the autofocus issue in dSLRs is not new. Why is it then that it has spiked in the last couple of years? Does the increase of megapixels in todays dSLRs have an effect or the decrease in quality control in manufacturing to meet the demand? Vartkes, sorry i am answering not question to me, but i believe that question is very general and everybody can have opinion in it. So, my opinion is that spark in production defectives (as always in market world, including other market sectors) is relevant to demand-supply ratio: more demand (like in current situation 2012-2014) – higher price/lower quality/with not so many new features for that price. Less demand (as it was in previous years of low economy) – less price/higher quality/maximum possible features at that price (otherwise who will buy that if unemployment is 12% ?). And higher number of pixels is just one of progressive features which are not relevant to quality control (actually there is also can be lowering quality but we can’t discover that with our home tests. But who among us can find 6,000 scattered dead megapixels among 6 megapixels? Only competitive company, but why to tell that to customers if that company can take advantage of that too?). High quality control and high quality manufacturing are working against company’s profit. So, i believe that the same (or similar) item is better made in hard economy years (with low company profit, but survived) than in good economy years (with higher company profit) if it is still on market. Don’t forget main task of ANY COMPANY – PROFIT, and not full customer satisfaction. Another my sorry for replying after 1.5 year, but i am new here. Many many thanks for the procedure to test the DSLR. I bought my D800E from India in March 2012, and was worried about the news of focus problems. I tested it as per the procedure you have mentioned and found that my D800E is not having any issues of focus on left side. I tested it with 500 f/1.8 lens. I feel a few of the cameras have the problem but not all and by this time Nikon might have silently fixed the problem with out acknowledging it, so that in public, one might feel that Nikon as such did not have any problem, it was the problem of a few units exaggerated in the cyber media. I think the lens I bought is damaged, or do you think this is a typical problem of this kind of lens. Please I want your opinion. I only have one week to return this product, after that I cannot change it but fix it. As you can see in the picture almost 70% (on live view) FAIL, my D90 mounted on the nikon lens 18-300 cannot focus, WHILE at the same distance and same camera settings the camera can focus as using the 18-55 and 55-200mm lens. 300mm FAIL extra bit s.
300mm FAIL Extra bit sound . Nasim is no doubt very busy and only comments from time to time so I’ll offer my opinion. You should return the lens. Since it’s an AF-S lens, any inability to focus is down to the lens, not the camera. While as a superzoom it may not be as sharp as a prime or a zoom with a smaller zooming range, it should still be able to focus at all focal lengths. It can happen with new lenses. I had a 300mm f2.8 that I had to return for autofocus failure. While not strictly necessary, I would include your test results when you return the lens. Thank you so much for your advice. Tomorrow morning I will take the lens to the store to be changed. The salesman told me that there is only one at his storage. If the new one is not working well too, they will give me back the money, and then they will call me back again when they get new lens. Glad if I could be of any assistance, John. It shows the importance of testing new equipment when you get it. That should also include some general shooting because test charts can only tell you so much. Then when you’re happy with the lens, it’s a good idea to do some systematic testing wide open at low ISOs with different focal lengths and different means of support (hand-holding, tripod, monopod) to find out what shutter speeds give the sharpest results with the way you shoot. I got the a new lens today morning. You are right, today afternoon and tomorrow the whole day I will take the lens with me to do a general shooting test. Again, I took some panoramic shots from from my window (25th floor) and I see that at 18mm f/5.6,8, 11 and even 16 are sharp, but after f.16 all the pictures are rather blur at f22 the picture is rather blurry. I will let you know my impressions of the new lens. No, that’s not right that you get the sharpest results at the smallest apertures. Perhaps it might be for some lenses if you didn’t have diffraction to contend with. What diffraction means is that as you stop right down, light increasingly bounces around inside the lens, reducing contrast and sharpness. With a DX camera, this will start to happen from about f5.6 but it takes effect very gradually so your sharpest aperture can still be stopped further down than that. The sharpest aperture for a lens is often about two stops down so for your lens it will probably be around f8 to f11 and this is also likely to vary by focal length. You could test this by shooting against a target or by looking up reviews on the net. It doesn’t necessarily follow that you should always shoot at the sharpest aperture, though. You may need to shoot wide open in low light or when you want to isolate a subject with reduced depth of field. Sometimes you might want to stop right down to maximise depth of field notwithstanding diffraction and in this case it’s good to understand what the trade-off is for sharpness. For panoramas, it depends whether significant parts of the composition which are close. If so, you may need to stop down further. Usually that’s not the case and your sharpest aperture may be appropriate. The most important thing in Photography is Vision – to see what you want the final image to be before you take the shot, to think about how to get there and to analyse how well you succeeded. Shot technique is just as important as the camera and lens and so is post-processing. For panoramas and other landscapes, sharpness is usually important, especially if you may want to make a large print. A solid tripod can usually make a big difference, especially if you lock the mirror up to eliminate mirror bounce. In addition to what Murray has mentioned, at f/22 your shutter speed has become very slow. Blur can be introduced a number of ways even if the camera is held on a tripod. You should convince yourself the blur at f/22 is not due to mirror slap or any camera shake before considering the lens to be the problem. Last weekend I took many pictures using the new nikon lens 18-300mm mounted on my D90, you can see them on my blog. Sorry, John, I forgot to reply at the time. I’ve been flat out generating prints for an exhibition. You’ve been having fun. You’ve got some great shots in some very interesting places and the focus looks fine. It does sound like you got a bad lens. Thanks for a very useful set of instructions and explanations. One thing I did not see, however, was any mention of how to work with cameras that have a front/rear focus adjustment, such as the Pentax K-5. With such an adjustment, it is often not necessary to send the camera in for repair, since the user can (theoretically, anyway) adjust it using a chart similar to the ones you provided. Do you have any instructions for this process? quick question in which I’d like to ask if you don’t mind. I was interested to find out how you center yourself and clear your mind prior to writing. I have had a difficult time clearing my thoughts in getting my thoughts out. I do enjoy writing however it just seems like the first 10 to 15 minutes are generally lost simply just trying to figure out how to begin. Any ideas or tips? Cheers! Write down your thoughts as they come to you-like a stream of consciouness. Go away for a while,come back and re write. Do it several times if necessary until it expresses what you want. I really appreciate your reply on this. Mahan, if 80% of the time you get accurate results, then your unit is not affected. hello all, i also check mine. i notice that at f8 everything is fine via viewfinder pics…but f2.8 has some little blurness on left and right….i am using d800 with 24-70mm…is it normal at f2.8? what i thing is D800 is back focusing should use like that or send to Nikon ???? My opinion is that since the D800 is in warranty, I’d send it to Nikon for adjustment. It may be usable but the next lens you get could be out of the adjustment range. I’d first send an email to Nikon, advise them that the body appears to be out of adjustment, detail your test results and ask whether you should just send the body or send the body with say the 50mm f1.4 to calibrate against that. Is some thing wrong with my lens or camera body. The first one is through LV and the others are through VF. I never get perfect results….would you say there is an issue with the camera? I love your website more than any other photography website. Its really commendable that you put so much effort in writing these blogs for the community. Now coming back to the AF issue, I recently purchase a D800 and using the method provided by you, I found that I have AF issues in my lenses and I corrected them by putting the following values in AF fine tune. What do you think is the main issue here ? Camera or my lenses ? I spent a good couple of hours testing my 5 lenses as per your wonderful instructions. Nikon 105 VR, 28-300 VR, 70-200 VR, 20mm & 24-120 VR on my D700. I have a few questions maybe you can answer. I’m not sure why you suggested printing on plane paper as opposed to photo paper, which I found to be sharper to start with. After the test, I found at 100% all my lenses looked sharp to me with some edge softness much like your sample good photo, but I’m not sure if what I checked at 100% is considered very sharp or just just sharp and could be better? Should the edges of the black lines on the chart have been absolutely crisp, pure black against white with no edge softening? or what I observed is par for the course? The Last thing that I found not included in instructions is how do you adjust the cameras focus based on the results. + or – ? On another subject I appreciate all the hard work you put into your articles. They are very thorough and informative. Mostly information other web sites do not even think of. Thank you. Good advice. I also recommend a test chart that offers a slope to check for front/back focus. It also helps the manufacturer determine the cause. I had a 3rd party lens that had a centering defect. I sent it in, specifying it had a defect, and they sent it back in the same shape. I then sent it in again. It was still not fixed, as it was in acceptable terms for them. I needed it to shoot well at 2.8. It was not as noticeable at f/4 and gone by 5.6. It was horrid at 2.8 though, with a lot of CA to boot. I finally did a proper test, comparing it to my assistants copy of the same lens, as well as a simple 50mm 1.8. The 4th time they gave me a new copy. It is not perfect, but worlds better. Then again, I am spoiled now by my Nikon 70-200 VRII, 50mm 1.4G, and 24-70, so it is not apples to apples IMHO. It is paramount to be confident in your equipment. It is one thing to make a mistake and scold yourself. It is another matter to do everything right, only to have the shot diminished by a faulty lens or body. Say what you will, but often times you really do pay for what you get. All well and good if your DSLR has live view. I wanted to say thank you Nasim for this Test. I got my first digital Camera last year by purchasing a D7000 after using manual focus cameras for more than 30 years… It has been a very long year not being able to focus correctly and having un-sharp images using all techniques… Thanks to you, Nasim, since using your test, I was able to fine-tune all my lenses and started to concentrate on doing what we do with these tools… making pictures. I really enjoy reading your point of views on different subjects. thanks for the post, i found it particularly useful because I noted that many of my photos at full aperture were slightly out of focus. I own a Nikon D7000 and Sigma 17-70 F2.8-4 plus a old Nikon 50mm F1.8E. I did the test with Sigma and i confirmed a backfocus problem, i should compensate the camera to -12 in order to get focus. I repeated the test with a friend lens, Nikon 16-85 and I found more or less the same result (-14). It seems that the problem is on camera… but how to be sure? My idea is to simply do your test by using the Manual focus instead of Auto; you know that even in MF the D7000 will aid the focus by showing on the bottom left corner of the viewfinder the focus status, and I guess that this is the “pure” camera focus measurement. So, if a backfocus problem exists with MF, it should affect all the lenses and cannot be imputed to lens! I repeated the test with all the lens in MF and I found the camera focus information was always accurate, so maybe both AF lenses had the problem! What do you think about this methodology with MF – is it correct or there’s something i didn’t consider? For the manual focus part of your method, I suggest you should be using live view. Then you’re focusing directly off the sensor and can zoom in as far as you need. Especially with that, then your methodology makes sense to me. Even if you do need some adjustment at the camera body, though, it doesn’t necessarily mean the camera needs repair. Good thing i found this article. It gives me an explanation in which nikon cebu, philippines is ignorant about. the sample image in your d3200 is just amazing. I bought a d3200 last month. Sadly i have to returned it. I just cant get a sharp image its just blurry. I even asked the technical guys if there are focusing problems with some units of d3200 they said they never heard one. There is really something wrong with the camera. this is such a bad experience for nikon beginners into photography. They will keep on scratching their head what went wrong and never ever got a sharp image. Nikon should address these issues seriously! Nasim, this is a wonderful article and answers many questions about the accuracy of autofocus – both by the camera and with the lens. An observation though. The procedure talks about testing the camera and preferably multiple “lenses” in general. The example that you use employs an f/1.8 lens. However, shouldn’t it be stressed more strongly that only “fast” lenses (such as f/1.8 or f/1.4) are most useful for this testing procedure because the greater depth of field with slower lenses could mask faulty autofocus problems? For example, I ran the procedure with a D300 and five lenses. On three slower lenses(f/3.5-f/5.6), every captured image (contrast detection & phase detection) looked just fine. It was only when I used the faster lenses, (f/2.8 and f/1.4) that problems appeared. The autofocus problem became clear with f/2.8 and was really very pronounced with the f/1.4 lens. Had I been using slower lenses only, I would have missed an apparent autofocus problem with this camera. Question from point 3: You state to turn af fine tuning off. Wondering why. In my case I have a D800e with a 24-70 and it front focuses (lens-align at 4.5 feet) which is resolved at +12. If ultimately that is what I use, why would I not test at that value? As a side point, perhaps related to the question, I find that when I test, the center focuses great and LV/CDAF is always correct L-M-R but the right and left sides always backfocus. Tom, the article assumes that no prior calibration was done, which is why I recommended to turn it off. If you have already calibrated your setup, then go ahead and keep the AF Fine Tune value at whatever it was before. Just make sure that the distance you are shooting at is approximately the same as the one you used to fine tune your lens (see Lens Calibration for details). I own a SpyderlensCal and plan to test my D800 and my 24-70mm 2.8 and my sigma 85mm 1.4. What is the correct distance to the chart ? i’ve heard 25x focal lens, 50x focal lens, and as close as possible as it will make the case more obvious? Very helpful article Nasim. I’m going to try this one. One question, recently I dropped my D3100 from my bag – it fell from approx. 5feet. I’ve been noticing erratic AF with my Nikon 35mm1.8G & Tamron 90mm 2.8 macro. I’m wondering if the impact of the fall caused the AF calibration to go awry? I ask because previously I didn’t get so many OOF issues with my 35mm 1.8 that I’m getting after the fall. Absolutely – see my article on lens calibration. I think that this test does not determine if there is a focusing issue. I did a test with my D800E and everything was just fine. Then I performed another tests, moving the AF point on the most left one, and I could see that there was a slight AF issue. I sent same samples a the Nikon service, and it looks that issue is confirmed. I am waiting to get my D800E back from El Segundo. Here more details about the test, which in my opinion is more appropriate. Ricardo, you can use the left AF point using the above mentioned method to test the D800/D800E – just print three charts and do the same test. Good luck with the service at El Segundo! I am getting back my D800E this afternoon. I hope everything will be fine. This is a great article that i’ve arrived at through pure desperation, i’m struggling to get consistently sharp images with my D7000 having tweaked the fine tune on several lenses but never quite achieved satisfaction. To reduce the operator error you mention have you an article on best practice for getting sharp images with the D7000 ? 1) Why it is important to have shutter speed of minimum 1/500 to conduct this test? Is it natural / obvious for phase detect AF sensor to misjudge the focus if shutter speed is around 1/10 and less ambient light? 2) You suggested that camera’s focus plane should be kept in such a way that it becomes parallel to the focus test chart. Why it is important to keep camera perfectly parallel to focus chart? 3) I have performed this test with 50mm1.8g. But I performed this test in evening with almost no natural light and with fluroscent lights on. Camera suggested optimal shutter speed of around 1/8 . In Live view I always got tack sharp images at center but when done through viewfinder I found it always front focusing by few 5 to 6 millimeters. I repeated this 7 to 8 times and found that it is always front focusing. I really got disheartened because in India it is not easy to get the problem fixed asap. But again I kept shutter speed 1/500 and to compensate the exposure I set exposure compensation to the fullest -> +5. I found that this time both through Live View and throught viewfinder I got tack sharp images! I am not understanding what is going wrong here. At shutter speed 1/500 there is not front focusing issue. At shutter speed 1/8 it is there! How shutter speed affects focusing? I am very much eagerly waiting for your reply. This would decide if I need to take back lens to Nikon and wait for few weeks to get it fixed or am I doing really something wrong. I wonder why you chose to place your printed target parallel to the plane of the camera? In other places I’ve read that the target should be at a 45 degree angle to the camera, which seems to make more sense. I mean, if you shoot a straight wall and your target is out of focus, how can you even tell if it’s back focus or front focus?? 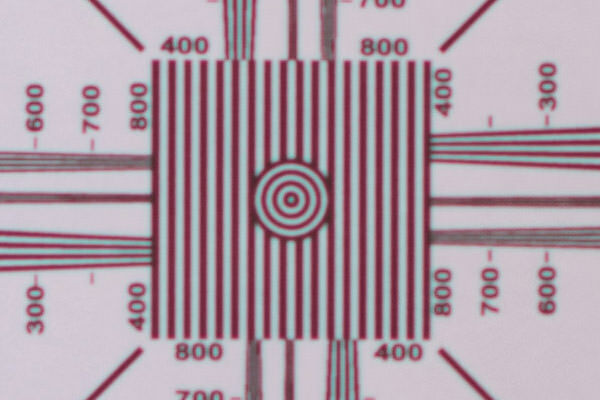 There are three ways of calibrating autofocus: a target parallel to the sensor, a target diagonally inclined to the sensor and using both (in which case you focus on the parallel target). My understanding is that the method with a diagonally-inclined target is not so good because there is not so much for the AF to focus on so the camera is more likely to make focusing errors. If you just use a parallel target, you need to make several exposures at different calibrations to determine which direction to go in. Great article. I’ve been wanting to do this test for some time now. I tested two lenses on by D7000 today and got good results in all tests except one. My Sigma 50-500 mm lense gave me soft focus at 500 mm on LIVE VIEW. When I used the viewfinder at 500 mm the focus was excellent; much better than I expected. I did six shots on live view just to be sure it wasn’t me. I used the remote to fire the shutter. All six shots were soft, although some were a little softer than others. When I used live view for all other focal lengths and the other lens the focus was excellent. Since I never use live view for photos, it’s not a big deal. However, this is really puzzling me because I thought live view was the better focus system. Thank you for the wonderful site and valuable information to share with us. The knowledge and tips helped me improve my photography techniques a lot. Photography is my hobby. I purchased my first DSLR, a D90, in 2009 and planned to upgrade to full frame someday. The time finally came. I recently purchased a D600 with kit lens. After receiving the set, I followed the test methods to check the DSLR autofocus with different lenses. The results taken thru live view and view finder were all good. Some images might be sharper and some might be less sharp but all in all they are acceptable to my eyes. During the testing process, I found that the 24-70mm 2.8 lens would not focus with the remote control unit (ML-L3) when the focus ring was rotated to its extreme ends (infinity or nearest focus distance). I manually turned the ring to either infinity or nearest focus distance. The first two times, the lens hunted a while before it acquired the focus. After that, the shutter was immediately released without acquiring the focus upon squeezing the remote control unit. The images were blurry. The 2470 is only one year old and was not used often. I am wondering what to do next. Any suggestion would be greatly appreciated. I came across this article whilst trying to sort out a focus problem I am having. I have a Nikon D4 and when fitted to my Sigma 500 f4.5 it will autofocus fine through the normal viewfinder, but when in live view it will not autofocus, each time I try to acquire autofocus it seems to step further and further in to the picture and more and more out of focus (not sure if that makes any sense to you). I haven’t noticed the same issue with any other lenses I own. I’m now a bit confused because you state that acquiring focus through the live view will always be accurate. Does this mean its a problem with the lens ? any advice is greatly appreciated. In that case there may be electrical contact problem at lens – where it connects to camera. So, it looks like camera trying to change something, but either there is no electrical feedback from lens back to camera or something like that. Try to clean contacts on lens and camera or take that bad lens off camera and try visually to compare bad lens electrical contacts with electrical contacts on other good lens. Otherwise may be something wrong with electrical circuit inside that lens – if camera sends correct signal but lens reacts wrongly. When you say auto AF, I presume you mean letting the camera set the focus point (and you can’t tell where it is) which is Auto-Area AF. Can’t say I ever use that mode myself because you don’t know what the camera’s doing so you have less control. In D600 terms, what you refer to as using the central focus point could be single point AF, dynamic point AF or 3D tracking. All of these should focus the same at the centre point. There may well be some difference between the centre focus point and side points due to lens curvature. Focusing with the centre points should also be more accurate because that’s where the cross-hair focus points are. If it were me, I use a mode where you can select the focus point and adjust the AF from a central point by preference. Alternatively, you could do lots of tests in different situations with different lenses and see what works best for you. Thanks for the reply! .. Yes I mean Auto-Area AF. When you half press the shutter it shows which focus points are used. Works perfect because it uses multiple points to acquire focus … but when I use single point AF, using the center focus point (which should be the most accurate), the test-chart is not sharp. Currently I only have the 50mm 1.4G… could it be the lens causing the center focus point to be inaccurate or is it the phase-detection sensor in the camera which is not calibrated right? I can use AF fine tune -10 to get the center focus point to be sharp, but then auto-area af is not accurate anymore.. I would presume that if the Auto-area AF were using just the single focus point you would get the same result and that the divergence is because outer focus points are behaving differently. You say it is not happening with other lenses so it is probably not sensor misalignment, rather lens curvature. The -10 adjustment you quote fits in with this because it represents back focusing. If so, I would think your focus would be inaccurate using Auto-Area AF where it happened to use predominately centre points and with single point AF when you use a side point. You could ascertain this kind of calibration variation by testing calibration at side points. I must admit I haven’t bothered to do this myself, so far at least. Hello Nasim! A very good article. Like others from you. Congratulations. I have an issue with the AF of my Nikon D300 and my nikkor 35 1.8 while shooting at f1.8. Sometimes , the focus is slightly (not much, but noticeable) in front or in back, most of time focus is ok, but there are small variations (not much) between a shot and the next. This is randomly. I use single point focus and AF-S, both camera and objects are static on a table. I don’t know if the AF system have a tolerance for get the focus or the AF must be exactly equal shot after shot under same conditions. Or i am doing something wrong. Could you or someone else help me with this issue? I am driving nuts about this. Being the happy owner of a great D600, perfectly satisfied with the ‘kit-lens’ 24-85 mm (purchased afterwards, after a lot of reading reviews) and still, every day, surprised by the superb image quality with my 50mm 1.4G, I decided to mount my 18-200m DX VRII, because up till now this 200m is my ultimate zoom-size. This lense is much criticized, I know, but mounted on my ‘good old’ D90 I have an outstanding, versatile combo for everyday photographing, especially in good, bright wheather conditions. On the D600 you have a bit more than 1oMpx available for images, which is enough, in a lot of situations. I am curious to know what you have to say about this! you are great and helpful!!! a ton of thanks! I got my Nikon d600 09/2012 with 24-85 vr and purchased Nikon 70-200 f4 and Nikon 16-35 f4 lens 03/2013. the Nikon 70-200 f4 is perfect sharp and fast focus. but Nikon 16-35 f4 is not sharp for landscape. I try to a couple of time almost same. I use f8,f11, f16 and f22 for same place, the background is blurred. I try to use hyperfocal to make landscape. it looks not sharp like your photos. I know I need to use tripod and remote control shutter and mirror up. I know I am just beginner still need a lot of thing to learn. I want to make sure my Nikon 16-35 f4 lens fine without any focus issue. after read your article, I will try to test my lens first. thanks again for your perfect help! Problem is, I have also found a problem with Live View focussing, and the manual focus sweet spot is often with the focus ring slightly left or right of indicator centre. A more accurate way to check focussing is as follows: set up an A4 sheet with Excel, with only a small cell about 10mm x 20mm in black, and a thin horizontal line throught it. Set up tripod 20-50 focal lengths away, the further the better. Aperture must be wide open, and lighting sufficient for ISO 100. Best shutter speed is 1/20 or longer, avoiding the 1/160-1/140 mirror slap vibration zone (varies with camera and lenses, my 70-300 at 300 is noticeable, shorter lenses not so much). Manually focus ensuring viewfinder range/focus indicator is centralised (centred exactly between left off-focus and right off-focus indicator points), and take a photo (timer/remote and mirror lock/up or Live View to avoid mirror slap vibrations (which I have definitely found in the zone 1/160sec to 1/40sec)). Now, using the ribs on the focus ring, focus to the left in 1/2 rib increments (taking pics as you go) until well out of focus according to indicator, and then focus to the right in increments of 1/2 rib until indicator shows off-focus. You should now have 5-9 pics. Putting the pics in sequence from left to right, the sharpest will be your manual focus sweet spot/offset (in my camera, on RHS limit of in-focus indicator). Now, take an Autofocus pic and a Live View pic, and 90% of the time you will see how bad they are compared to the rig’s best point as established by your ranged manual focus exercise. My 24-70 is dead sharp at 24 and f2.8, both in the live view and not, at the 70mm end, at f2.8 the live view is dead sharp but the regular focusing is not. This seems like it should be a problem with the lens and not the camera. Is my thinking correct? The image, at 70 is not “bad” it’s just not as good as at 24mm. Should I send the lens (given that the lens is the problem) in to get it fixed? Sounds like a case for calibrating the lens provided you have a camera that accepts microfocus adjustments. Sending the lens in would be expensive and may not even solve the problem. Even considering that the 24mm end is perfectly fine? Would I be taking away sharpness from the 24 end to make the 70 end sharper? It’s usually a compromise with a zoom, unless perhaps you have a Canon 1Dx which allows two settings, one at each end of the zoom range. The telephoto end is more important for the setting usually because the depth of field wide open is less. I do have a lens in with Nikon for adjustment because of the calibration settings but in that case the discrepancy was extreme, something like +20 at one end of the zoom range to -20 at the other. I looked at my test photo again and was able to sharpen it, in ACR, to a totally acceptable degree. I might play around with the focus adjustment a bit, maybe splitting the difference, or I may not even bother. In real life, in non test pattern photos, after sharpening, it’s probably not worth worrying about. I’ve had my Nikon D800 into Nikon service 3 times for focus issues. The first time they just took the camera body. The second time they took my 24-70, 2.8 and adjusted that as well. I tested the lens with a calibrator and it was still off. So I brought both back a 3rd time. I took them out tonight to test them – and not one clear shot. In fact all are horribly blurry – worse than I’ve ever seen. I’m soooo upset and frustrated. I’m going to do this test tomorrow with my D800 and all three of my lenses, and then straight back to Nikon for my FOURTH visit!!! I have 3 shoots this coming weekend and cannot afford this wasted time. Argg (sorry – venting some major frustration with NIkon right now). Tx again for the help. I am going to carry out the test again using your methods to compare the results to eliminate any set up errors, although it does look like the AF on the D800 has some sort of issue. thank you thank you! I have been looking everywhere to find how to do this! I just got a 50mm 1.4 for my D800 and it seems very soft. I will give this a try and hopefully I can get my shots nice and sharp! Thanks for this article. Although I have been doing focus tests for quite a while, I have learned something new, especially taking the first shot in live view mode. However, I have a question: I quite often find systematic differences in the results when the focus is aquired from the far end versus the close end. I lately wanted to purchase a Nikkor 300mm f/4, and the sample I got showed spot on focus when focusing from infinity, but had massive frontfocus when focusing from minimum distance. Masive means: the zero line almost never was in focus. I usually do 5 images focusing from infinity and 5 images focusing from minimum distance, and I do not change the setup in between. This bothers me, since it is not possible to correct it with the AF fine tuning. I have similar behaviour (in terms of systematic differences between focus aquisition from far vs. close) with my Nikkor 40mm f2.8, but it is still usable because the zero line is always in focus. Do you have any idea what could cause such behaviour? And whether it is more likely to be a problem of the lens or the camera? PS: of course, I returned the lens…but I’m not sure if the problem is with the camera. Kathrin, this sounds like an AF problem on your camera, especially if it happens on multiple lenses. You always want to calibrate at your working distances, which is typically pretty short (under 10-15 feet) for telephoto lenses. I would send your camera + lens to Nikon and have them take a look. Do send image samples of what happens though, so that they know what to do. I read through the comments and didn’t see this question asked yet, but would it help to use some off camera strobes while shooting the focus test pages? Or would that mess up the test results? I was shooting at f9-f16 on a couple of models the other day with 2 640ws strobes and the focus is on the wall behind them, and although my DOF is huge I noticed it was slightly off. So I’ve ruled out motion blur and any movement depth wise from either me or the model, but should test shots be taken both wide open and stopped down? Nooooo, don’t do that :) Shooting with strobes will completely invalidate the test results. You need continuous ambient light to do this properly… do it from a tripod to eliminate any kind of shake and you can use slower shutter speeds too. Did this test on my D7000, and the focus was VERY out!! Tried to calibrate my lenses, but +/- 20 was far from sufficient. Sent it back to the dealer together with three printed example pictures, and voila; approx 10 days later I received a fixed camera with tack sharp focus – So thank you very much for this well written article! Thanks Nasim, this is exactly what I needed. My Olympus E-3 is constantly out of focus and I cannot figure out if it is the camera or the lens. It is usually happening when I shoot in challenging light situations and I know Olympus is not good in that, but now I can at least make a few tests. Thanks for the article Nasim. I recently purchased a Canon 7D with a Canon EF 70-300mm f/4-5.6 IS USM Lens. When I do your test shots at 70mm they look great. However when I move the camera back from the test pattern and zoom to 300mm neither the live view or the non live view images are crisp or really even close. Am I being unrealistic to expect this test to produce crisp focus at 300mm? Thanks for your help!! Thanks for the article Nasim. You well described how to do the test lens but I tried your method and I had problems with it. I was looking for some other possibilities and I found on eBay auctions, where I bought Lens Focusing Jig(I found it on ebay by typing: Lens focusing Chart). It is very simple to use and here provides a link to the manual. First of all thanks a lot for explaining how run this test. I bought a used Nikon 50mm f/1.8D lens. I went on a photoshoot where I mostly shot on f/2.0-2.5, and I noticed that most of my shots were not that out of focus but a little blurry. I found your test in google, and I realized, that camera and lens focus perfectly in live view mode, but in a viewfinder mode for the aperture range of f/1.8-2.8 (ONLY) when I manually go wayyy out of focus and then switch to AF mode and shoot I always get this slightly blurry images. Only after I refocus one or two times I get a sharp result. So what do you think is this a AF problem, or something else? It’s a cheap lens, and I am afraid that fixing would cost more than buying one. Yes, definitely the lens, because other lenses work fine and I just realized that I have d90 and it has built in AF while 50mm does not. I recently discovered that I may have a focus issue on a Tamron 70-300 lens that bought. But, I have it mounted to a Sony A77. As you are probably aware, the Sony has full time phase detect due to the translucent mirror. How should I conduct this test in light of full time phase detect? I thought that it might possibly be a hybrid system where the contract detect would fine tune focus, but I did have a test shot out of focus that became tack sharp with manual focusing. I will also note that this close range and indoors in low light. It was mounted to a tripod, so I wasn’t worried about motion blur, but possibly the low light didn’t allow the contrast detect to fine tune? Thoughts? I thought that it might possibly be a hybrid system where the contract detect would fine tune focus, but I did have a test shot out of focus that became tack sharp with manual focusing. I will also note that this was close range and indoors in low light. It was mounted to a tripod, so I wasn’t worried about motion blur, but possibly the low light didn’t allow the contrast detect to fine tune? Thoughts? After looking around a little more, I think that the A77 is phase detect only. Not sure where I read that its a hybrid system, but it appears that there is no contrast detect. I guess that means that I need to do a trial and error method to determine the sharpest focus with no real base line. I could manually focus, but I think it would still come down to trial and error when setting the micro adjustments. Thank you very much for the helpful article. My results after two attempts show that two of the three photos taken without live view seem to be slightly out of focus compared to the live view. But then I find at least one of the three non-live view images looks acceptable. Does this mean I have a problem where I should send off the photos to the manufacturer? I have bought a Nikon Prime 105mm f:2.8. I think there may be something wrong with the focussing of the prime. At a properly-lit condition; lens just hunts for seconds to find something to focus and it is very slow…:(((( I have watched a tutorial about the speed of this lens on youtube of 105mm Nikon f:2.8 yesterday and it was very fast to me. Could you help me over this? First of all nice post, just the best, real useful. If some one could help me I would really appreciated, I have tested with 2 lenses my camera and in one don’t have any doubt that I have a problem in the other… I don’t know because I am a bit magoo. I have the material almost running out of the warranty so if same one could help me fast I would love. Thank you so much for sharing your knowledge. I was going crazy, thinking I was having focus issues, checking myself over and over. I thought that my old 24-70 2.8 was done and I probably would have to buy a new one. But then I saw the same problem (even worst) with my new 70-200 2.8, how could it be possible? Same problem with the 85 1.8…that’s when I started wondering. The problem is that I have two D800 so I didn’t think it could be a camera problem. Thanks to you, I tested both my cameras with 3 different lenses and finally realized that the problem is with my new D800 the one I bought only a couple of months ago. It has a mack warranty so I will be taking it tomorrow to my usual local store that also works with Mack, and hope they will fix it as soon as possible. Still have the other D800 but as I always work with two bodies I am so glad I kept my old and loyal D300. Hi just found this article,very useful. However I am in Europe, will the test targets work ok still if printed in A4 as we don’t have letter size paper here? I am glad I read your article. I have an issue with my D800E where in I need to dial in -20 AF Fine Tuning for both my lenses (Nikon 50 mm 1.8 G and Tamron 24-70 2.8). My camera is fairly new so I am curious to know how Nikon fixes these issues. Do they do a soft fix e.g. using a software or do they disect the body and mechanically allign the phase detect AF system? Hello Nasim, I own a nikon d5100, it does not have an autofocus motor in the body. Do I need to test it for autofocus issues? Very Nice and eye opener!!! Thank you for this article. Since it was written two years ago it is now becoming more and more useful since there is a lot of “older glass” but “newer chips” with higher resolutions. I will definitely come home today evening and try my camera with both lenses I have (only one standard 18-135mm and one 100-400mm pro lens). I thought my camera is focusing incorrectly when shooting wildlife but I have found out that the use of low shutter speed along with only handholding were the main reason. After increasing the shutter speeds (close to 1/1000 and faster) I am getting much better results (yes, I am an amateur :-) ). But I have a question though: consider the lens is focusing correctly for normal distances (e.g. when shooting wildlife photography with a tele lens consider distances from 5 to 20 meters). Should it also focus correctly on objects far away (e.g. 50-100 meters)? The reason I am asking this question is simply because with my 100-400m lens (I usually use aperture of f/6.3) I have realized that objects being 2-10 meters are really sharp, objects being 10-20m are “sharp enough” but 20m and more they are not that sharp anymore while with the distance the sharpness is worse and worse. I had a chance to shoot an egrets and herons from few meters in free nature and I have very nice results while I was also trying to shoot cormorants around 100m far while the images very extra blurry or soft or both while I think also some distortion was taking part of it. Is it a common thing or even if I focus on 100m distanced objects shall they be sharp as well? Thank you very much for the answer and yet again for this article! I would assume that for most people with a new lens and/or camera the chances this test would work “out of the box” are rare, correct? Because most lenses (in my experience) require SOME adjustment. Once you microadjusted your lens/camera body would this be a good test to confirm your microadjustment values you used are correct? In other words, I just used LensAlign to calibrate my lens and ended up with a setting of +9 so I assume this would be a perfect follow up to test to confirm there is no back/front focus. Brian did you do the test after the lens alignment ??? Was it easy for you do align the lenses by yourself ??? I’m having some focusing problem with my D800 and my 14-24mm f2.8 and the 24-70mm f2.8, was expecting that the camera would be sharp as a knife. When you take the 3 test shots are they supposed to look “identical?” For some reason I am getting varying degrees of sharpness between the 3 tests even though they are back to back, same lighting, same manual settings, etc. I “racked” the lens in between each shot as instructed. I have done the tests exactly according to the instructions. The result is that sometimes the autofocus when using the viewfinder autofocus (not Live View) the results are a little soft or even a bit unsharp. But this happens only in 15% of the images. In 85% of the images the result is tack sharp and I get the same sharpness and quality as my “reference” shot (Live View shot). My question to Mr. Mansurov; Is this normal that the results vary a little (15%) and why do they vary ? Does it mean I have a possible auto focus issue ? This is a very helpful article. Just ran the tests as you recommended using my d700 and d300 cameras. I am having a unique problem: with my 100-400mm Nikkor Lens, at 400mm, the Live View images are not very sharp but, when I use the Mirror Lock Up mode, it is very sharp. Even at 1/1000 shutter speed. I am very confused. Can you please help me understand this? While that makes total sense to all of us here, reasoning with Nikon customer service is like trying to discuss algebra with a 4 year old. Yes, returning a purchased item to the store increases everyone’s costs, but it seems that Nikon doesn’t seem to care. According to them shipping and insurance for warranty claims is always the responsibility of the customer. That’s $70 to run the risk of Nikon coming back and say there’s nothing wrong with the camera. It’s no wonder why people return them to the seller, even though I agree that’s not the best thing to do. 1. If the Live View does not present a sharp view, close to the sharpness you presented in the article, doesn’t that indicate a problem with the lens, without needing any other lenses , (especially if you have only 1 lens?). 2. If you can’t get sufficient light could you use a flash? Basically, all my lenses came back tack sharp in live view. My 50 is the only one that is sharp when shooting the other way. I tested 5 lenses. I mostly shoot with my 50 and my 70-200 and have just never seemed to get tack sharp pictures with my 70-200. Thanks for this article! I had my lenses calibrated with a company but it still looks like some lenses need a bit of an update. I’m considering buying the spyder lenscal. Awesome article, the amount of brilliant info you can find on this website is phenomenal! I thought I’d look for an article on this on google, but then I thought I’d try here first and lo and behold, I find this gem! Thank you, Nasim! My D600 and 24to70mm is Sharpe when is 50 to 70mm focus length. it worst when 24 to 50mm . i can’t shoot the wide . how to make adjustment on zoom lenses ? This is a really nice article. Thank your for the step-by-step procedure. Citizen-science is powerful, and some corporate giants are beginning to learn this. Local camera shops run by people who LOVE photography are becoming in short supply. What you are advocating is SCIENCE. This is EXACTLY the kind of breakdown I was looking for! Thank you so much for this article! i guess i have a different take than most. I’ve been shooting professionally for 25 years. raised my kids and bought my home on the proceeds. i need this equipment to work right out of the box. many thousands are on the line. if canon knows they have (lets say) a 1 percent failure rate of their product out of the box they should address this. It should not in any way be the responsibility of the purchaser to deal with. They should have a built in program to immediately send a pre calibrated and tested lens to the consumer without question. one that is known to be correct because its been tested in their lab. then they can then deal with their manufacturing defects correctly. believing that its the consumers job to identify and deal with their crappy QC is inexcusable. if these lenses are tested before leaving the manufacturer this wouldnt happen. what ever happened to pride in your work ? I would never be able to send an out of focus shot to a client and “if they notice a problem” i might fix it at their expense. what a joke. who knows better than Canon wether the calibration is dead on. its their job to deal with it. NOT THE CONSUMER. sure its unreasonable for a purchaser to expect every item to be perfect out of the box. but to have to deal with it after spending thousands is ridiculous. I own over 12k worth of canon gear and rely on it to feed my family. if i have a problem with calibration i expect it to be taken care with minimum hassle on my part. they should send me an absolutely perfect brand new item if i have any concerns no questions asked. If they are making a quality product that policy should not affect their bottom line but enhance it. they should be embarrassed and apologetic about the mistake. NOT aloof and uncaring. this is what happens when companies get too big. Im considering selling all my Canon stuff and buying a second medium format rig. WAY better IQ by the way. the thought of having to calibrate my 7 canon lenses and two Mark III bodies is worse than a nightmare. it should be right from the factory or made so with no effort on my part. They already have my money ! give me a break. Canon needs a better policy concerning quality issues. I know of other companies that would never treat a consumer that way…even if they are more rare every day. I have a D700 and was using , Angenieux 24-70 zoom. The autofocus will suddenly stop working and at times even the shutter release get frozen. if I remove the lens and re attach, the AF function will work again. but then again the same problem gets repeated. I have been setting the aperture to the smallest value. But when the AF stops working, the LCD screen shows the F 11…………..
Great article. Thanks for taking the time to put this together. I have calibrated my lenses. I understand why we should turn off the lens fine tuning when we capture the focus chart in Live View mode. But since my lenses are fine tuned should I turn it back on when I capture the second image without Live View? If I do not turn it on I know the images will not be in focus because they are not calibrated. Very informative and useful article, Thank you for posting. When using auto iso in manual mode with external flash E-TTL II meter, my iso range is limited to a max of 400 iso. Is this a canon standard or my settings are not correct? I would like to have the option to chose the iso range instead of the camera limit of 400 iso. Your help would be much appreciated. Just read the article and it makes things clear to this newbie! I am going to set up a test area and see how I make out. I always seem to get shots that are almost in perfect focus but lack a little bit to make them great. Thanks for all this info! I was hoping you could clarify two things. 1. Is it not recommended to conduct this test at or close to a lens’ suggested MFD (Minimum Focus Distance)? If not, why? 2. You state in the instructions that “The goal is to stand close enough to be able to have a shallow depth of field.” Is there a recommended minimum depth of field?